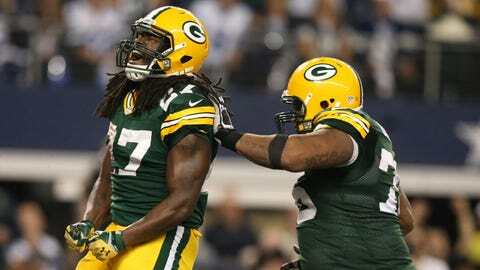 Eddie Lacy (left) and the Packers had reason to celebrate after his game-winning touchdown at Dallas, and then again a day later when Detroit lost. GREEN BAY, Wis. — And just like that, the Green Bay Packers have full control over their postseason prospects. One day after the Packers completed an improbable 23-point comeback Sunday in Dallas, they watched from home as Baltimore Ravens kicker Justin Tucker drilled a 61-yard field goal to beat the Detroit Lions. Now, if Green Bay wins its final two games, the Packers will be NFC North champions, qualify for the playoffs and host a first-round game at Lambeau Field in January. Heading into Week 16, the Chicago Bears (8-6) lead the division, followed by Green Bay (7-6-1) and Detroit (7-7). The most likely scenario is that the NFC North title comes down to a Week 17 matchup in Chicago between the Packers and Bears. Green Bay even has a chance to be the No. 3 seed in the NFC. That would happen if Chicago beats the Philadelphia Eagles (who are 8-6 and lead the NFC East) this weekend and the Packers win their remaining two games. If the Bears lose to the Eagles and Green Bay beats the Pittsburgh Steelers in Week 16, the Packers would still have to win at Chicago in the regular-season finale in order to finish with the better record of the two. However, if that scenario plays out, it would open the door once again for the Lions to claim the division if they win their last two games (home vs. New York Giants, at Minnesota). All things considered, Green Bay’s chances at making the playoffs are calculated at 27.6 percent. Yes, the Packers can make it easy on themselves by winning out, but they’re placed at a statistical disadvantage by having to still play on the road against the Bears. Chicago has the best chances at winning the division at 49.4 percent, while Detroit’s loss dropped it down to a 23-percent chance. On Monday, coach Mike McCarthy said he had "no interest in watching" the Lions-Ravens game, instead choosing to focus his attention on the upcoming matchup with the Steelers and also attending his sons’ basketball games. Still, McCarthy must certainly have been glad to find out the Lions gave Green Bay the opening it needed to conclude this wild season with a spot in the playoffs.